This is a very interesting article about #Travel Snacks for Kids. It incorporates treats with snacks and fun ways of giving them out. Ideas like “mile marker snacks” where you get the treat after each milestone marker and “good behavior tickets” in exchange for snacks. It also gives ideas as to unique snack containers which are actually common household stuff like tool boxes, fish tackle boxes and foldable beauty bags. Interesting! #Traveling with kids can be kinda scary. When Wes was a month old we took a flight with him and Stella (then almost 3) and I swore I would never fly with them again. Both of my children screamed for a big part of the flight. I screamed for a beer when we landed. Looking back I realize I was ill prepared with both activities and snacks for the kids. I guess I was so sleep deprived I thought I’d just wing it! Almost a year later we’ve taken many trips by car since then and we even got on a plane again in May of 2013. It was such a success people on the plane even commented about how well-behaved my kids were. Huh? Me?! 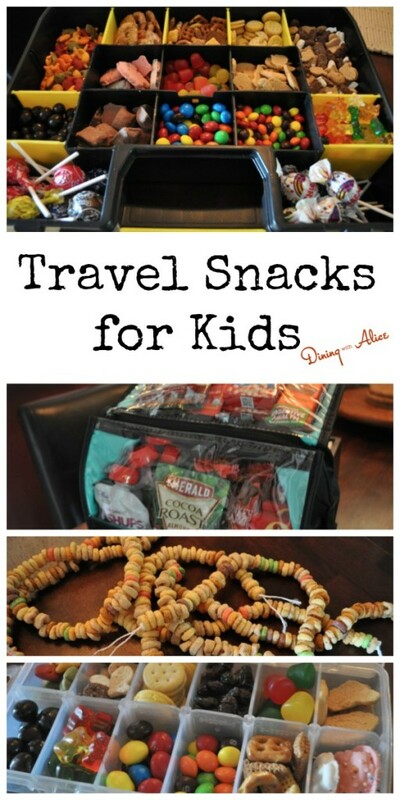 Here are some fun travel snacks I use for flying and car trips.